The first coal tract, which was scheduled to be auctioned off last week, had no bidders. Nonetheless, I find myself utterly confused as to where Obama actually stands on climate change. 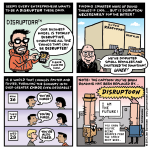 I’m not opposed to disruptive technology, or change in general. iPhones happen. But simply valuing market upheaval for the sake of market upheaval strikes me as a little self-serving. It’s an approach that tends to benefit the owners of a company and the financial industry, which thrives on churn, but not necessarily the public. If anything, it seems most people could use a little more predictability and stability in their lives — the comfort of knowing their mortgage will be paid, and their health insurance kept. Commenters on Daily Kos pointed out an essay by Judith Shulevitz on this very subject that had coincidentally appeared in The New Republic just a few days earlier. Well worth reading. For the next 48 hours, you can view an exclusive comic I drew for NSFWCORP #4: TWEETS IN MEATSPACE. Link will expire after that! For more on this absurd story, this NYT article explains it all. In short, Missouri’s health care gag rule came about as a ballot measure approved by voters. It seems to me that such a speech-limiting law would be in violation of the Constitution, so the local Tea Party should be up in arms about it, right? 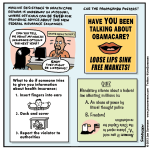 In any case, Missouri, be sure to check out healthcare.gov (or even better, enrollmissouri.org). 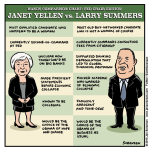 This is not to say Larry Summers’ titanic oafishness is not a factor. 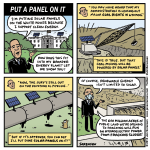 There are so many egregious moments from his career that I wanted to include in this cartoon, but couldn’t — the fact that he sided with Ken Lay and Enron during the California energy crisis, even after some economists were raising the possibility of market manipulation; his dismissive attitude toward climate change while Chief Economist of the World Bank, and subsequent opposition to the Kyoto Protocol; his opposition to the Volcker Rule as part of the Dodd-Frank banking reforms; his memo to Obama significantly underestimating the amount of stimulus needed. The list goes on and on. Seriously, no woman who has been as wrong about as many things as Larry Summers would ever be considered to lead the Fed. Yet the meme of the “brilliant” Summers persists. I’m sure the man has written some smart academic papers and may well possess great intelligence, but that’s not the same thing as getting it right. If you want to understand what’s sticking in the craw of Summers opponents, it’s that we’ve seen this story before. It’s the simple unfairness of of having to work so much harder to reach the top, and if you do, you’re seen as the “gendered” pick. It’s symbolic of every time a highly-qualified woman hits the glass ceiling when forced to compete with a loud, arrogant blowhard with a strong sense of self-entitlement and undeserved mystique of greatness. I hold out some hope that Obama will make the brave decision here.